Or we might just call him ‘The Man who won everything’. And no, it’s no exaggeration, because the German won all the trophies that he could achieve in an outstanding career with the national team and also with Bayern Munich. 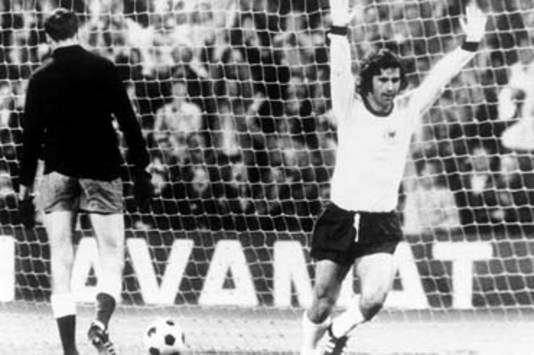 But we must refer first at the main reason that made this text possible: the opening goal from EURO 1972. Muller was then two years after an incredible World Cup where he netted in ten and so, Belgium, the hosts, couldn’t stand him too much, so after 24 minutes he put one in. And another with 19 minutes to go and so RFG won the semifinal with 2-1 and qualified in the final, which would eventually also won, 3-0, against SSSR. The striker scored again twice. A first European title for his country and a title of top scorer for Gerd, but nobody wasn’t surprise as Muller was by then in the pick of his form. 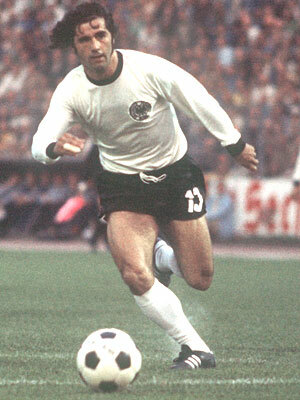 Born on 3rd of November 1945 Nordingen, a city of approximately 20 thousand inhabitants from Bayern, Gerd Muller started at local TSV 1861, at the age of 15. 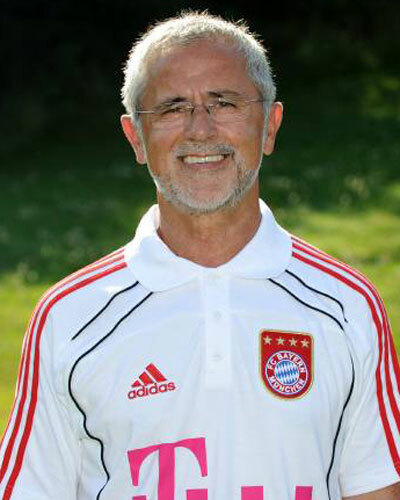 Three years at junior sides, and a stunning season at the senior side, between 1963 and 1964, brought him the transfer to Bayern Munich. The 51 goals scored in 31 matches (!) convinced the German giants to sign him. Bayern was playing by than in the second tier, but the striker hadn’t a problem with that. He scored 33 times in 26 games, won first place and brought the squad to Bundesliga. Here, the story begun, so from 1965 and until 1979, one of the most important pages from the history book of the club was written. Four titles (1969, 1972, 1973 and 1974), four Cups (1966, 1967, 1969 and 1971), three European Champions Cup (1974, 1975 and 1976), one Cup Winners’ Cup (1967), one Intercontinental Cup (1976), two European top scorer titles (1970 and 1972), seven German top scorer titles (1967, 1969, 1970, 1972, 1973, 1974 and 1978), four European Cup top scorer titles (1973, 1974, 1975 and 1977), 607 matches and 566 goals. All for Bayern. Is this enough? It should be, but it isn’t, because he performed even better. So he won 27 distinctions with Bayern or individual while playing for them, but Muller also done a great job for the national team. He had a quite short spell here, as he appeared first time in 1966, at 21 years, and last time in 1974, when he was only 29. Eight years, but eight years filled with glory. Besides the European title mentioned in the first part of this short story, he also achieved the World Cup. Not in 1970, when he scored 10 goal, but in 1974, when RFG hosted the tournament. He only put in four pieces this time, but including one against Netherlands in the final game (2-1). After that, he ended contacts with the national side. He gathered 68 goals in 62 matches, with made him one of the few players from the history of football which scored for his national team an average of more than a one goal per match. And considering his high numbers he stands very far in front. Still, Miroslav Klose may overpass his goal scoring record, because he has 63 goals by now and with only six to go he’s quite close. But Klose played more than 114 matches for the national side, so the difference is obvious. The two also share Germany’s record of goals scored at the World Cup, with 14 each. 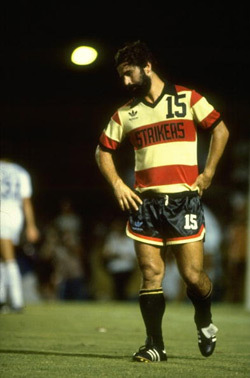 After 1979, Gerd Muller didn’t retired, but chose to play two more years, which were spent at Fort Lauderdale Strikers, a squad from Florida, USA. He reached the Championship final in 1980, but didn’t win it. In almost three seasons here he didn’t won anything, but kept his goal appetite and netted 38 balls in 71 matches. 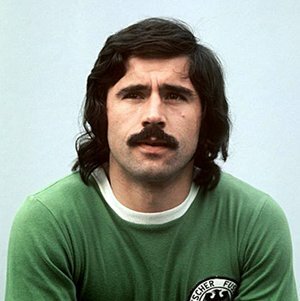 And because a short description of Gerd Muller couldn’t be something else than a endless enumeration of trophies, records and statistics, let us end it by sharing the total professional matches played and goals scored of this unbelievable striker. So, between 1963 and 1981, in nearly two decades, Muller appeared in 709 games and put in 655 goals!!! Sure, Pele and Romario claim that they scored more than one thousand and they probably did, but nobody can compare the achievements of them with the achievements of the probably best striker that Europe gave to football. Unfortunately, Muller’s health was put in danger by alcoholism, but luckily, Bayern Munich, didn’t forget what he had done for the club and gave him all the help that he needed. The officials and former team mates convinced him to fight against his addiction and after, from 2008, named him assistant coach at the second. 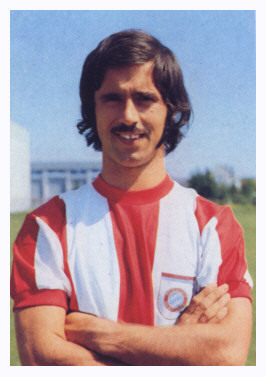 Photo sources: worldfootball.net, conti-online.com, airang.co.kr, gerd-muller.blogspot.com, goal.com, aneki.com. Acest articol a fost publicat în Campioni și etichetat 14 goals, 1974, 1975, 1976, 566 goals, 62 matches, 655 goals, 68 goals, 709 matches, Bayern Munich, Bundesliga, EURO 1972, Fort Lauderdale Strikers, Gerd Muller, Germany, Nordingen, Pele, Romario, USA, World Cup 1970, World Cup 1974. Pune un semn de carte cu legătura permanentă. World Cup story 1: Boniek from Honduras!